After our initial exploration of The Burren, Bob and I continued to the peak of the limestone plateau in order to locate Poulnabrone Dolmen. There, 8 kilometres (5 miles) south of Ballyvaughan in County Clare, it rises majestically and sits conspicuously in the middle of a field. 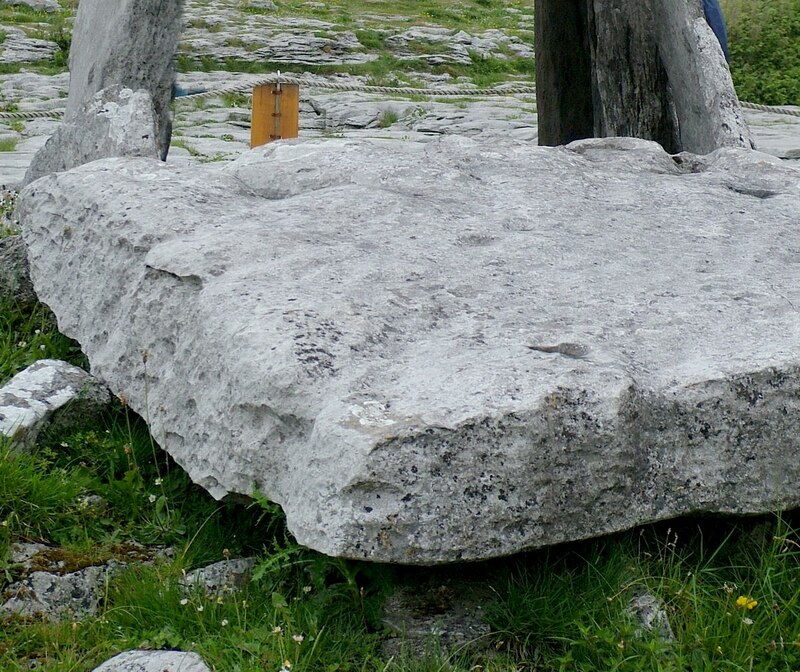 Poulnabrone Dolmen, and many others, still stand today as stone sentinels at the gates of our civilization’s history, history that is laid bare on The Burren. This portal tomb that is as old as the pyramids of Egypt was in use between 4,200-2,900 BC. Two portal stones that are 1.8 metres high (5.9 ft.) frame the entrance, and help to support the thin capstone that is a staggering 3.6 metres by 2.1 metres (12 ft. by 7 ft.). It slopes to the rear of the structure. 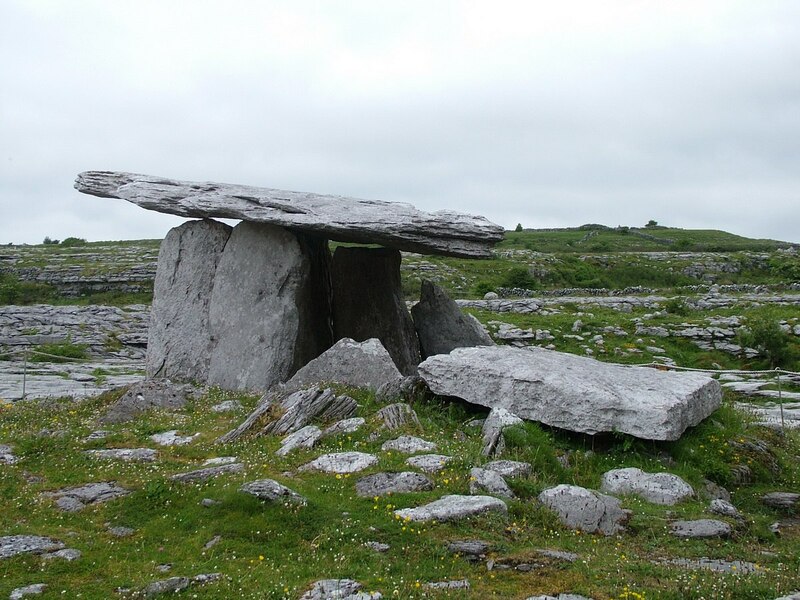 The enclosed chamber is partially supported by the shallow oval cairn in which it sits, and a broken sill stone crosses the entrance. 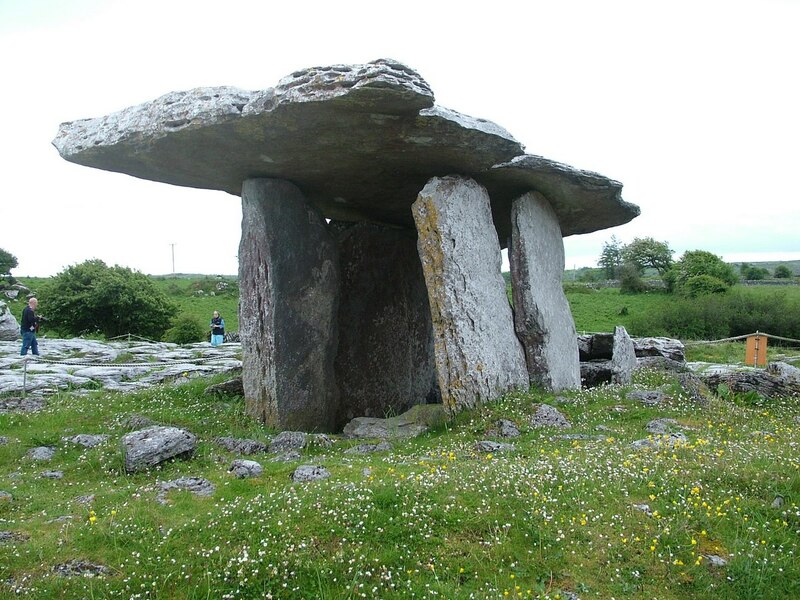 It may have once been propped against the capstone to close the burial chamber. 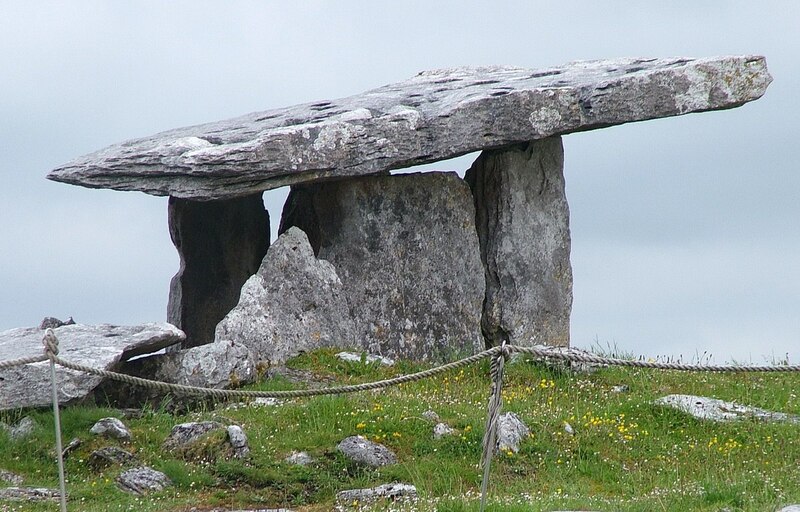 The cairn was made of large limestone slabs that extended out from the tomb for about 3 metres (10 ft.) and were laid against the side of the burial chamber. 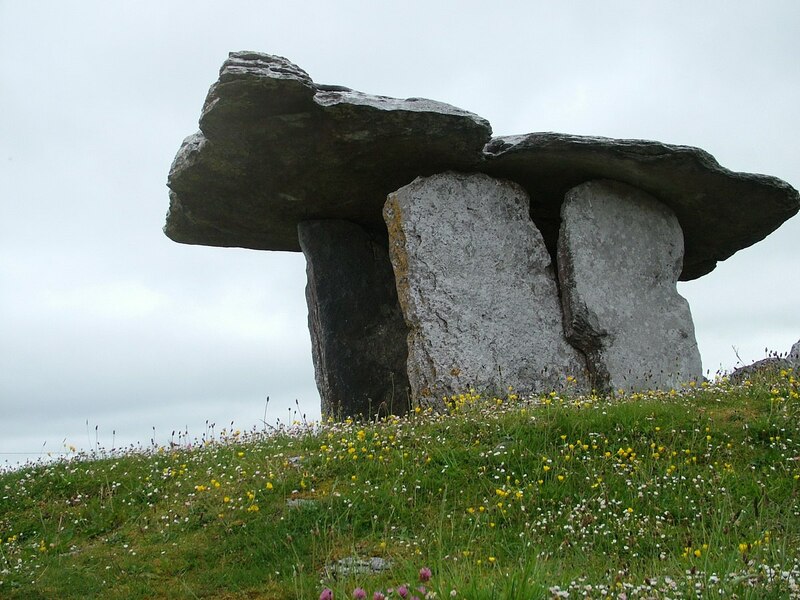 No one knows how our primitive ancestors moved or raised the massive stones used to build the Dolmen, but likely wooden rollers in combination with ropes and brute force were involved. Ramps of earth and stone could have been a means to haul the capstone into place. Poulnabrone Dolmen has been carbon dated to 6,000 years of age, and this ancient, awe-inspiring stone structure holds secrets from the past that may never be unraveled. 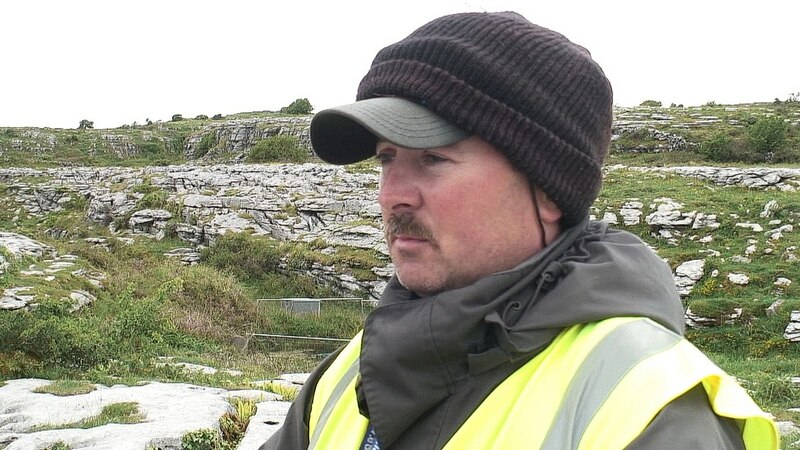 We did learn quite a bit, however, from one of the extremely knowledgeable guardians of the site, Joe Clancy. 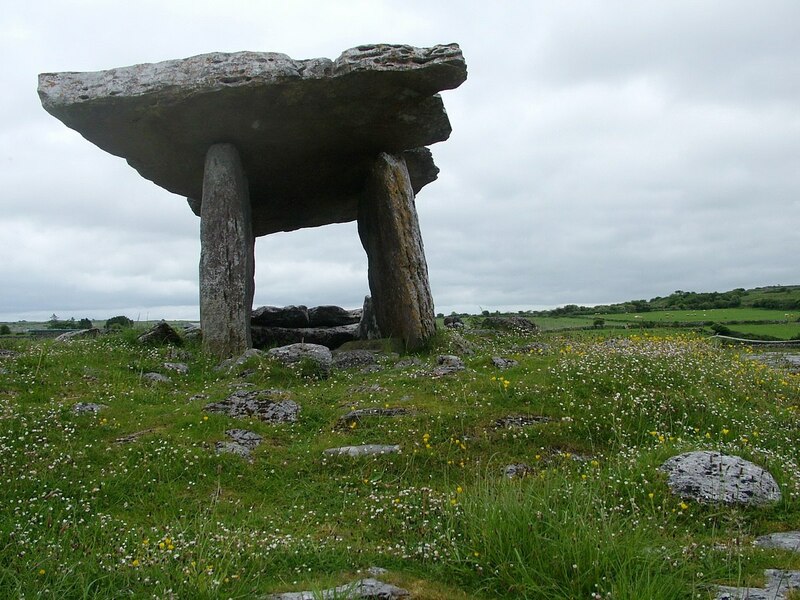 He shared with us lengthy stories about the history of the Dolmen, the issues with visitors, the rare flora and fauna, archaeological finds in the area and allowed us to know something about his own personal life. The name “Poulnabrone” means “the hole of the sorrows”, and indeed, the stones of Poulnabrone Dolmen tell a compelling story of life and death. The Neolithic people who lived and died here endured a relatively tough existence, one wrought with malnutrition, violent attacks, and childhood illnesses. Of the approximately 22 people who are buried there, 16 were adults, most of whom died before reaching the age of 30; one lived beyond 40. Evidence shows that, even at that young age, they suffered from arthritis caused by a life of ceaseless toil. One person had the tip of a flint projectile embedded in his hip bone, and healed fractures were visible in others’ skull and rib. We know they ate a coarse diet that likely included stone-ground cereals judging by the analysis and wear of their teeth. 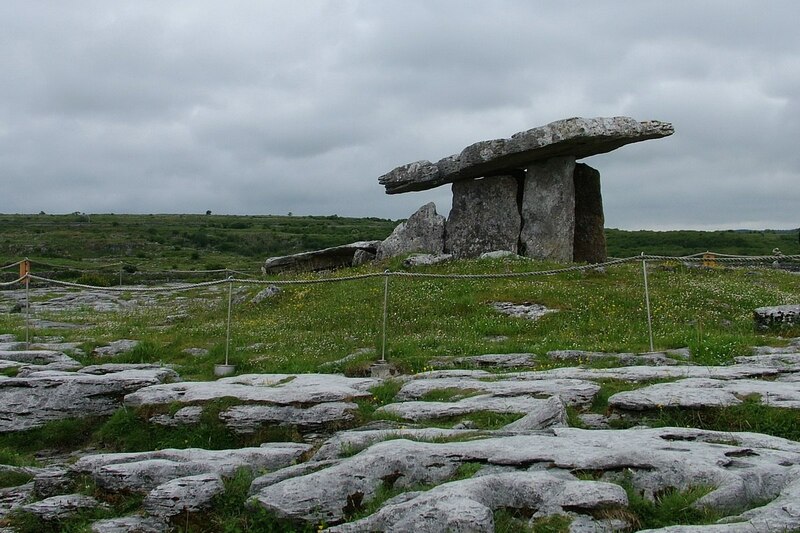 This megalithic monument that rises prominently above the limestone pavement was also the sacred burial place of six children between the ages of 5 and 15. Personal items buried with the dead included a range of artifacts: a polished stone axe, decorated bone pendant, quartz crystals, flint and chert arrowheads and scrapers, stone disc beads, a section of a bone pin, and fragments of coarse pottery. During the Bronze Age, around 1700 BC, one newborn baby was buried in the portico, just outside the north entrance of the tomb chamber. Only select members of the ancient community were worthy of burial in the revered location of the tomb, and it was probably the hub of ceremony and ritual well into the Celtic period. 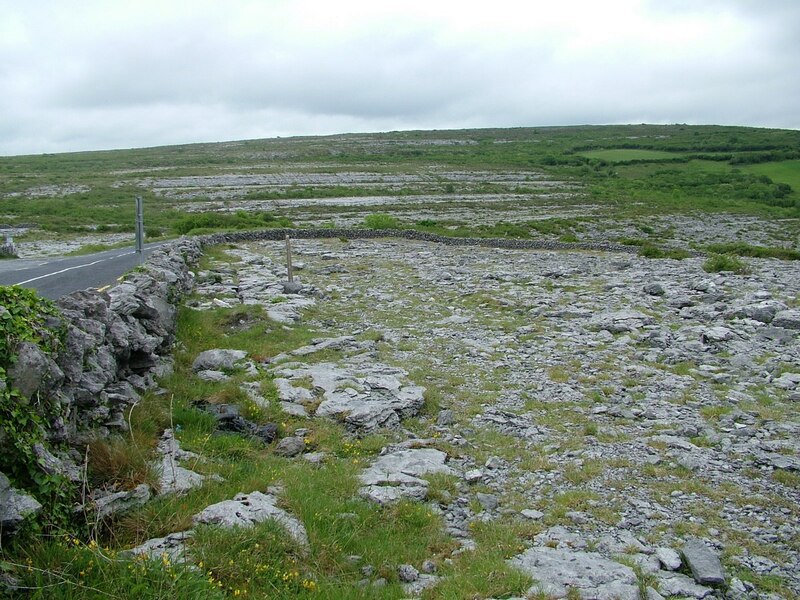 Because of its dominating presence on the karst of The Burren, it certainly could have served as a territorial marker on the Neolithic landscape, as well. 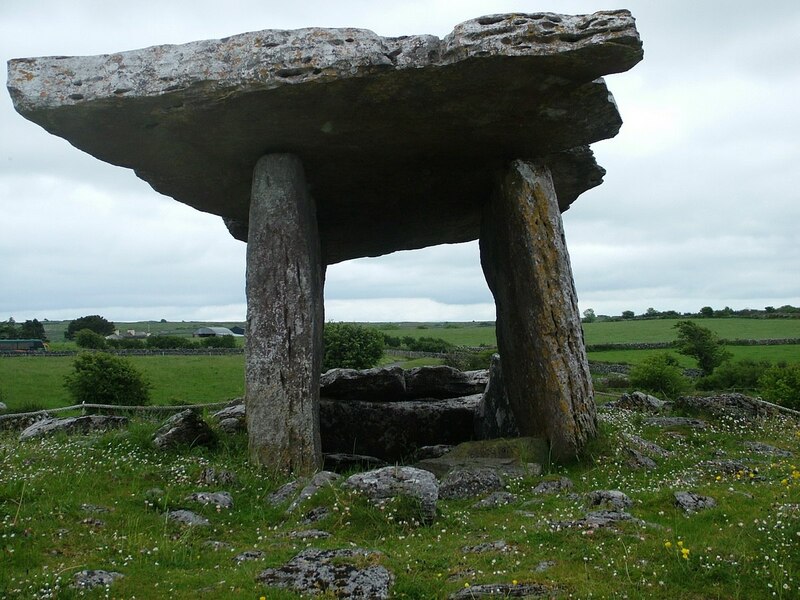 Dolmen speak to us from the olden days of our mythical and mystical past and provide a rare glimpse into the lives of our early ancestors, but still, many questions remain. Why were the bones of the deceased first buried elsewhere and then moved to the tomb when the bones were bare? Were they venerated as ancestor relics? Why are there 70 other tombs in the same area? These ancient mysteries wait to be discovered in that unspoiled corner of Ireland. A deep sense of wonder and curiosity pervaded Bob’s and my minds as we left the Poulnabrone Dolmen, in County Clare behind, but it wasn’t long before another piece of Ireland’s past would pique our interest. For the next hour or so, though, we had to concentrate on getting to Ashford Castle in time for dinner.